Nasturtium 'Jewel Mix' produces a colourful medley of yellow, orange, creme, crimson and salmon flowers with one flower colour per plant. Bush type to 40cm tall. Each packet contains about 25 seeds. Nasturtiums are annuals which originate from the highlands of Peru where the temperature is quite cool, when planted in warmer environments they have the potential to grow over several seasons. Nasturtium 'Jewel Mix' is a favourite garden variety which contains a wonderful mix of plants with different coloured flowers from the rarer creme, salmon and crimson ones to the more commonly occurring orange and yellow ones. Although a bush type Nasturtium, the plants can be semi-trailing and will sprawl to form a thick groundcover when planted close together. This variety grows to about 40cm tall and has flowers that emerge just above the foliage. 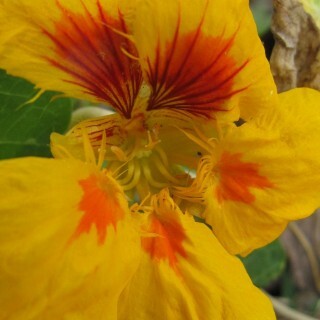 Both the leaves and flowers of nasturtium are edible. The leaves have a pungent, peppery taste that is nice when mixed through a salad in moderation. The petals of the flowers have a similar pungent taste but the flowers have an added bonus, a touch of sweetness from the small amount of nectar held within the spur at the back of the flower. The green, immature seeds can also be pickled and used as a substitute for capers. Nasturtiums are beneficial as they repel both Pumpkin Beetles as well as Cabbage White Butterfly which can be a major pest of Brassicaceae family members, plant Nasturtiums in close to any potential host plants as prevention against these pests. Nasturtiums are also used as sacrificial plants against Aphids and Two-Spotted Mites, when planted nearby these pests will generally prefer to feed on the Nasturtiums and will leave your vegetables alone. For best results Nasturtiums should be sown directly into the garden as they can be fussy when transplanted. Although they tolerate a wide range of conditions, they do best when planted into rich soil (although not too rich or flowering may be reduced) in a spot with some protection from the hot afternoon sun. For best results sow from Spring through to early Autumn, except in cooler temperate regions where they should be sown during Spring only. Space plants about about 20cm apart. Cover the seed only lightly with soil as they require some light to germinate, as they'll be close to the surface be sure to keep the seed well watered so that they don't dry out and die. Germination takes between 7 and 12 days. Nasturtiums will self sow readily in the garden, so watch out if you don't wish to grow it year after year and be ready to pull any Nasturtium seedlings that pop up. Flowers best during the warmer months of the year. The first flower buds should begin to appear a couple of months after sowing.